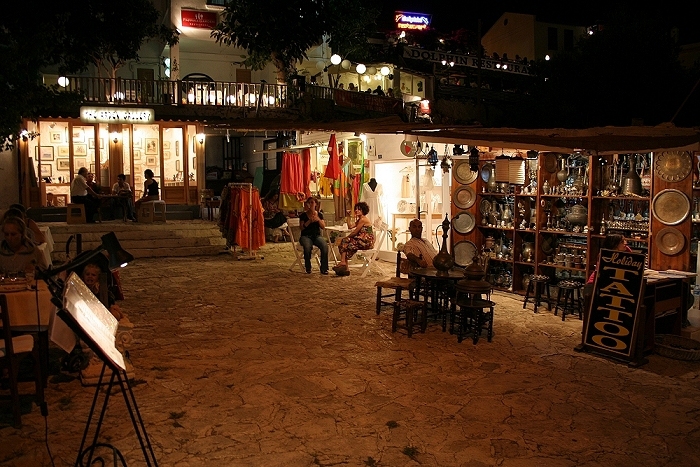 The Tourism Festival opened in Kas and a few days ago an art exhibition was opened. 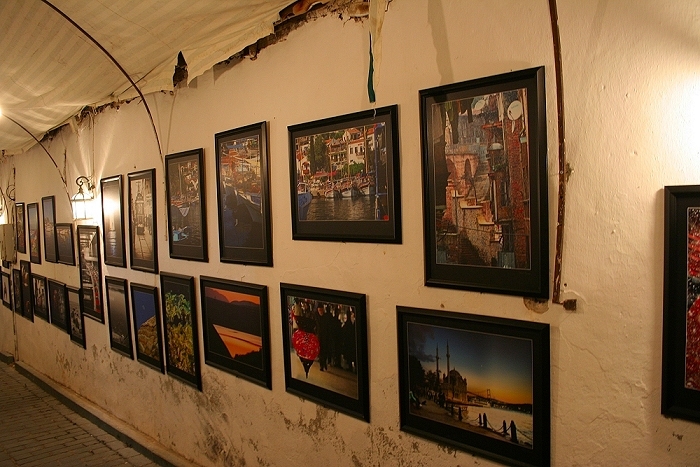 Many paintings and other artworks were on display in the streets and shops, here are a few of the pictures I took. A striking painting by the artist Binnur Aydınyurt from Yeşilköy. Both sides of this street were hung with paintings and photographs. This corner was full of metal pots, oil lamps, coffee pots and other decorative items which carried on into the square adjacent. 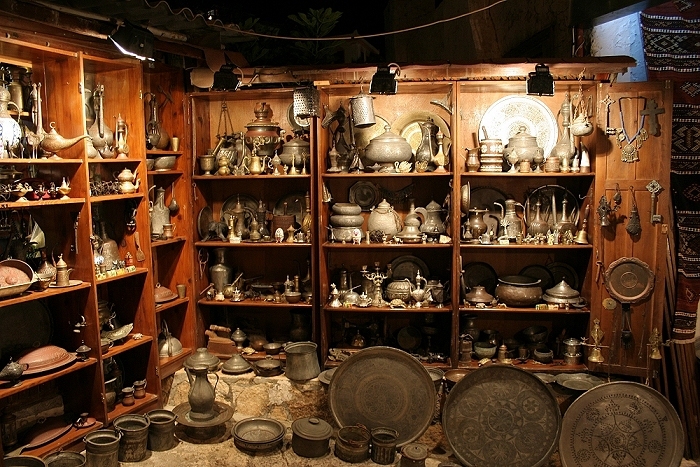 Here were more metal items, ceramics, clothes and paintings. 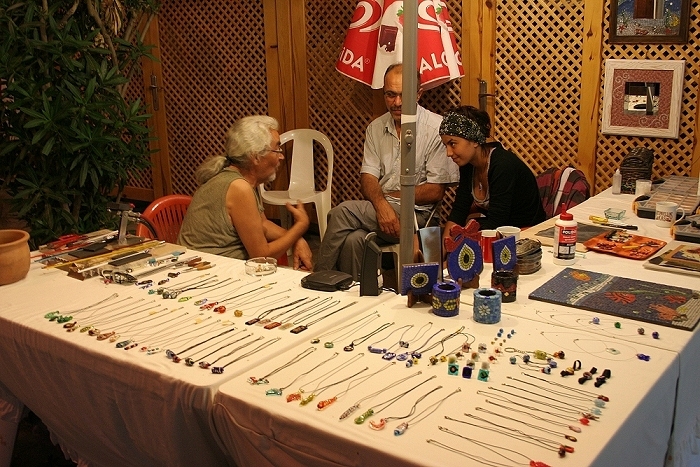 This guy made glass pendants and other jewellery. You can see his tools at the end of the bench, he made things while you watch. 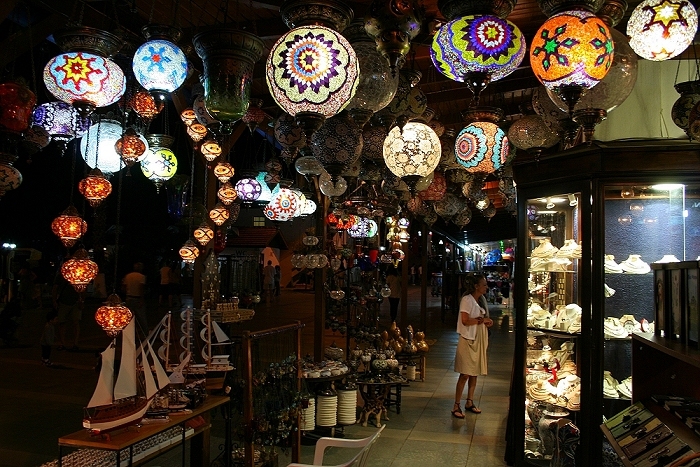 These colourful lamp shades are made from little pieces of broken glass, they look beautiful all together on a corner in the town. Being warm here in summer is quite normal, temperatures of 40C and higher happen regularly but I’m posting this picture of a weather forecast site because I like the terminology. Not for these folk to say ‘very warm’ or very sunny’, check out Friday’s forecast. Now THAT’S what I call a forecast, tell it like it is lads. 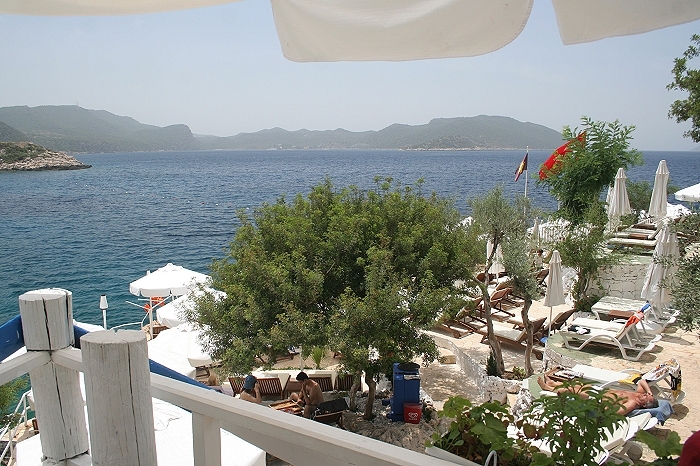 To continue from my last post, the bat was hanging from my bedroom ceiling so I left it there with the door and windows shut to stop Stanley the cat taking too much of an interest in it and I went down to Kaş for breakfast with some friends at Küçük Çakıl Plajı (Small Pebble Beach). It really is small too, the actual beach is only about five or six metres wide. There was also a basket of home made sweet bread buns which came later. 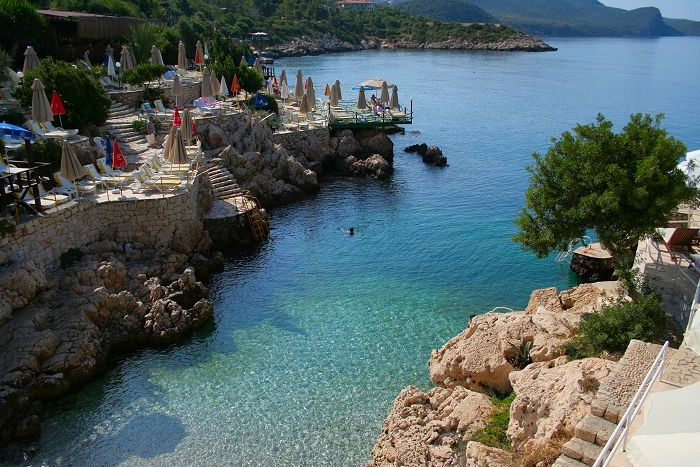 The Küçük Çakıl Beach area at the eastern end of the town is where most of the hotels are situated. 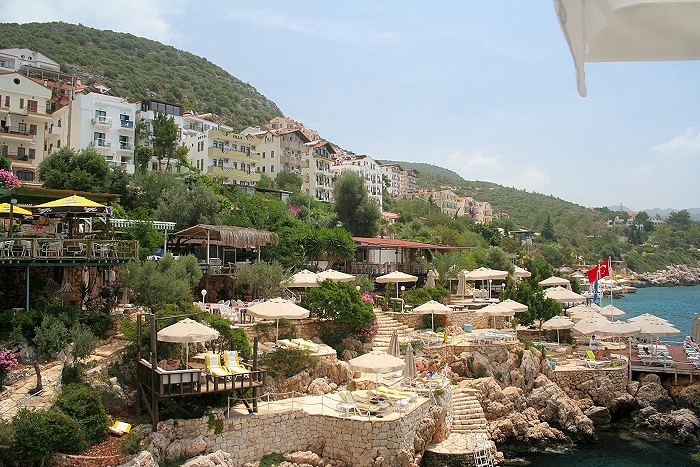 There are only two big hotels though, the majority of accommodation in Kas is provided by smaller, boutique hotels like these. The western end of the town has more small hotels and pensions which cater to backpackers and those with a more limited budget. When I returned from breakfast the bat hadn’t moved so I left it alone for the rest of the day. I’d been invited to dinner with some friends in the village so in the evening, before I went, I opened the bedroom windows in the hope that it would find it’s way out after the sun had gone down. 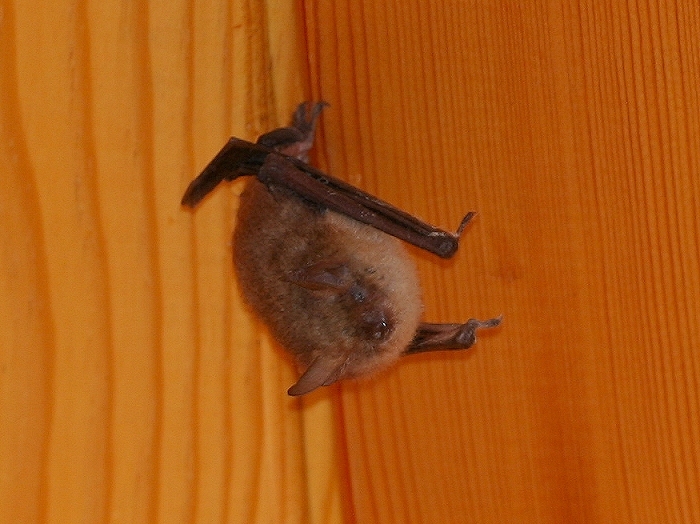 I also hoped I didn’t end up with a colony of bats in the bedroom! After a very nice meal and some good conversation I got back home to find the bat gone. Success! I hope it was none the worse for it’s experience. Walking up the goat track near my house the other morning I thought about how many times I’ve wanted to come up here. My neighbours , the çobanlar (goatherders), make their winter camp just up the road from my house and it sits astride the track so I’ve never wanted to disturb them by bringing the dogs through. 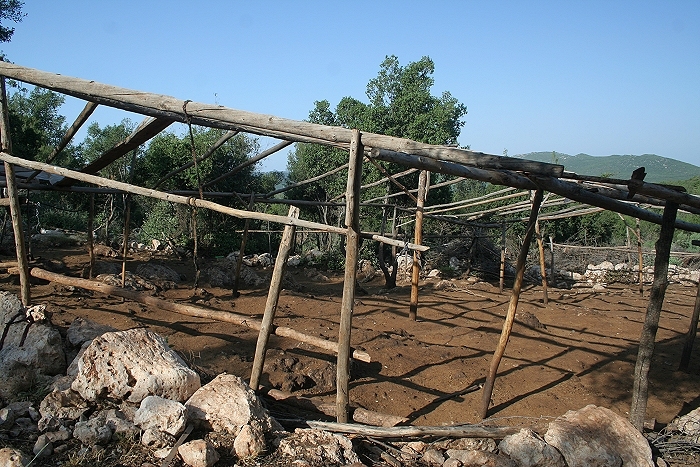 Recently though, their camp has been abandoned for the summer and just the frames of their shelters are left standing like so many skeletons. Quite eerie. 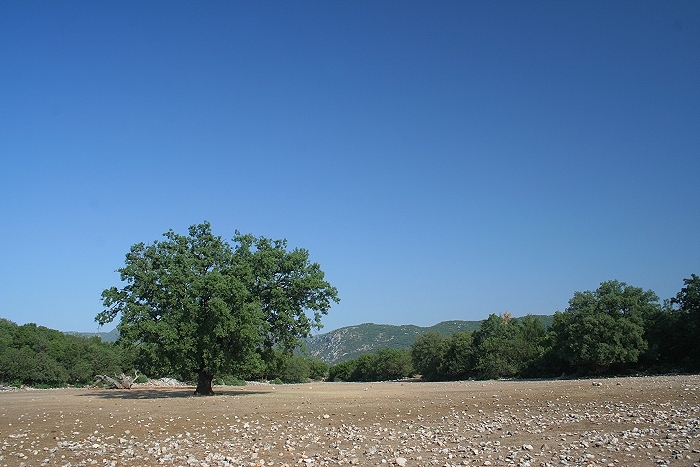 They have taken their goats up to the yayla, the mountain pastures, for the hot period of the year. There is more to eat and it is cooler up there. Past their camp is a track to a large open area with a big tree in the middle of it. You can see it on Google Earth and with the naked eye from the top of the mountain at Phellos. I’ve often wondered what it would be like to take the dogs for a walk there. 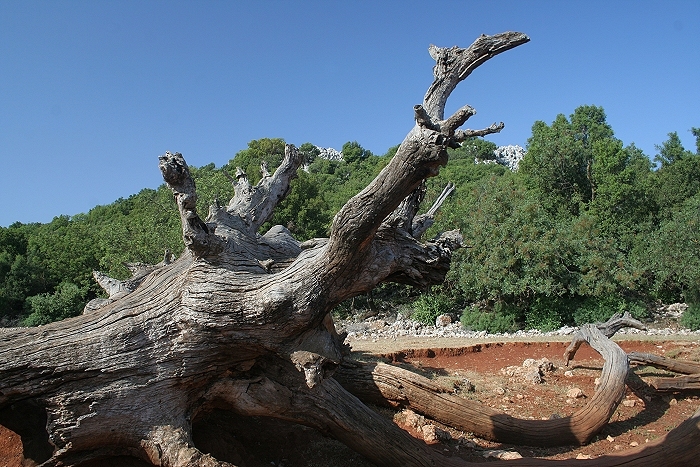 This fallen tree looks reminiscent of elephants to me, the shapes and greyness of it create that kind of feeling I think. 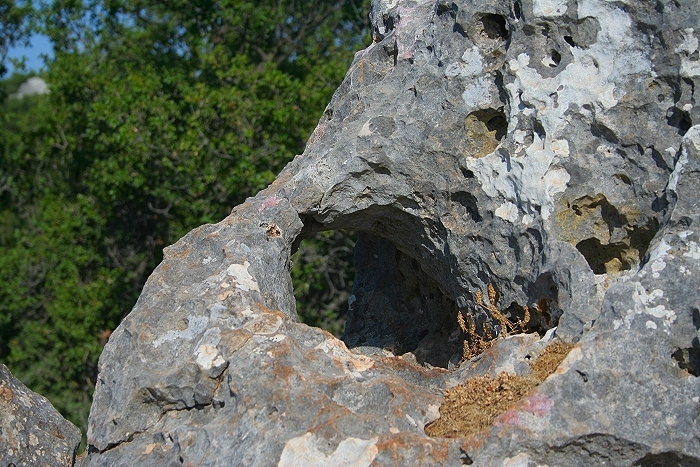 This rock with a hole eroded in it caught my eye too. Kurabiye is a kind of small sweet bread similar in appearance to a Hot Cross Bun in England. The texture is firmer and they’re not quite as sweet but the new bakery in Kas makes very nice examples. As I’ve mentioned previously Hanife’s milk is so creamy that I let it stand to separate then skim off the cream. 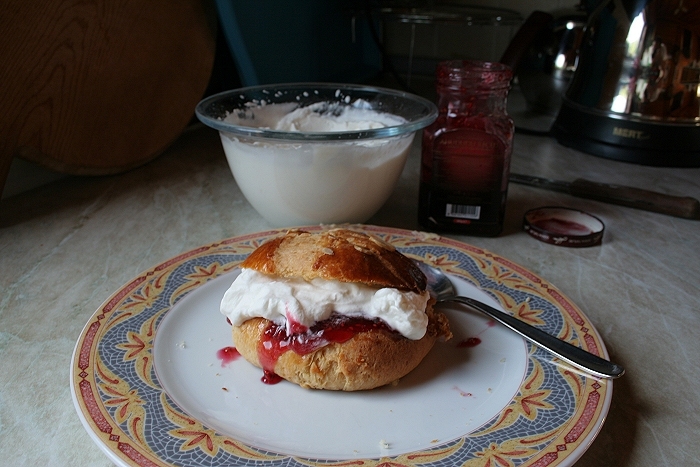 Well this afternoon I had Kurabiye with whipped cream and strawberry jam, extremely indulgent of me but it was lovely. 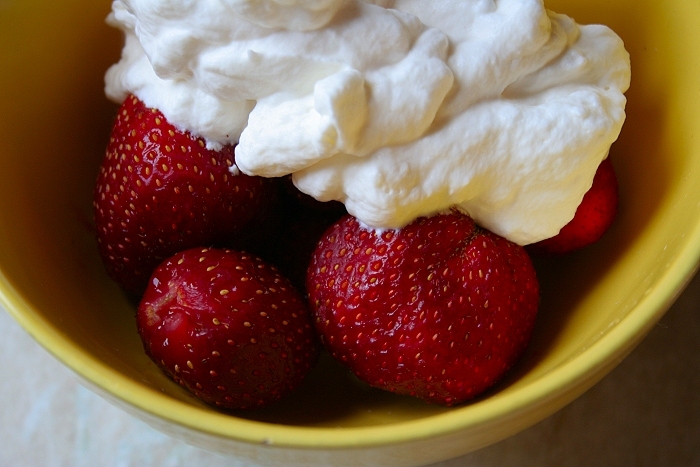 I had cream left over and later in the evening I had a look in the fridge and found some strawberries that I had forgotten about for a few days. I felt very guilty for about a nanosecond and then thoroughly enjoyed them. The strawberries were beautiful, really tasty. A strange sort of shuffling sound woke me in the middle of last night. When my cat, Stanley, gets something in his ear he shakes his head rapidly and it makes a sort of soft shuffling clapping sound and that was the closest I could come to the sound that had woken me. 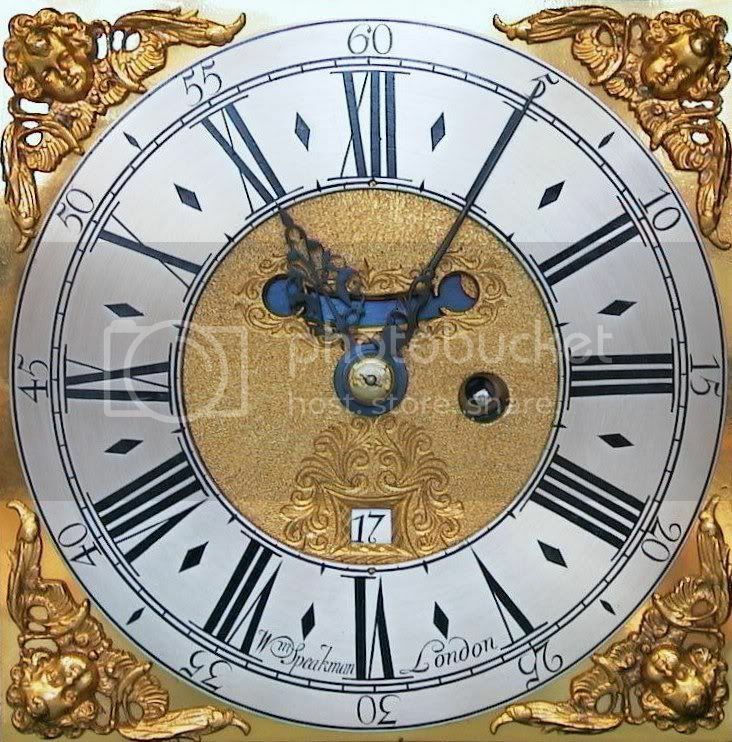 But this time it kept repeating and going on for longer and longer. I sat up in bed, turned on the bedside light and saw a bat fluttering around obviously trying to find a way out of the bedroom. The windows had been open till about nine last evening and the bat must have come in looking for moths or maybe even for a place to roost. I opened a window for a few minutes but the bat didn’t find it and I didn’t want to invite mosquitoes into the house so I closed it and we both went back to sleep. This morning I looked around and eventually found it behind a curtain, as I tried to photograph it away it flew up to the ceiling. I don’t want to chase it out into the sunlight now so I’ll let it stay there and leave the window open again this evening in the hope that it finds it’s way out and back to it’s normal roost. It’s a dear little thing and they fly around outside a lot in the evening at this time of year, there are thousands of big moths around so they must find food quite easily. This one looks very well fed doesn’t he? If he doesn’t find his own way out this evening I’ll have to try and catch him but catching a creature as quick and agile as this without hurting it won’t be easy. 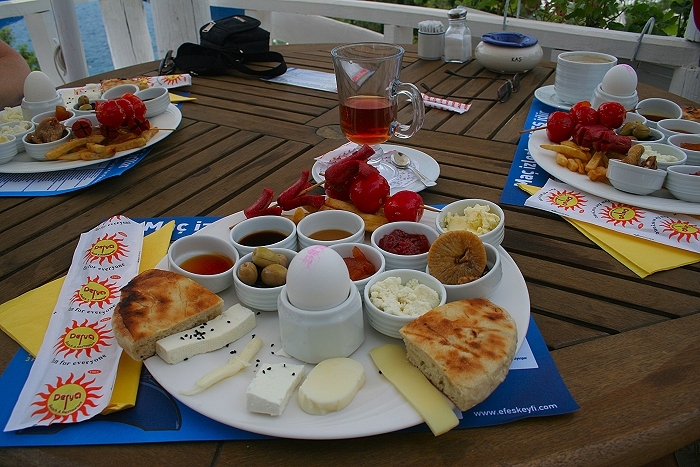 I’m going down to Kas for breakfast at the Derya Beach Restaurant with some friends this morning so I’ll post a couple of photographs of that later and let you know how I got on with the bat.